While we’re batty about bibimbap and can’t get enough kimchi, hands down our favourite Korean export is the super clever cushion compact. Offering the beauty enhancing benefits of a BB or CC cream, and typically a high-level SPF of 50+, these new age foundations use a sponge ‘cushion’ for a feather-light, skin perfecting effect. The best part? They’re 100% portable and spill-free, making them perfect for desk to d-floor touch ups. 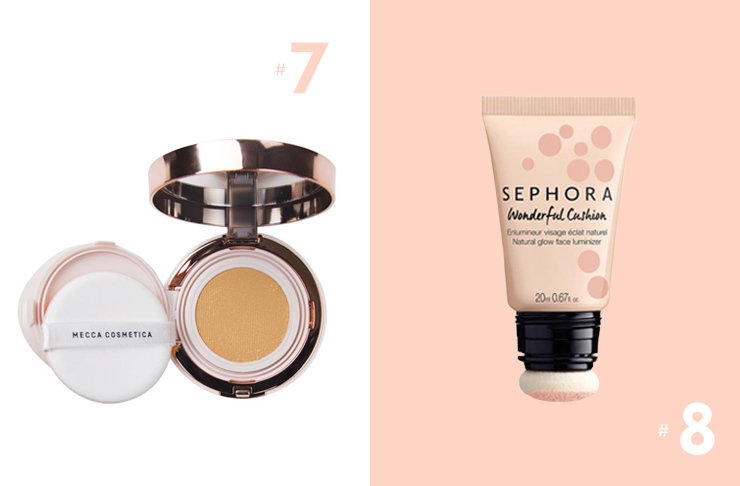 Here are eight cushion compacts we’re crushing on right now. Add to tote and go. Packed with peptides, niacin, algae, Vitamins A, C, B, and E, hyaluronic acid, and hydrolysed collagen, this little beauty will give you an It-Girl worthy glow, while treating your skin. Silky and light, it’s super easy to blend and build your ideal level of coverage. 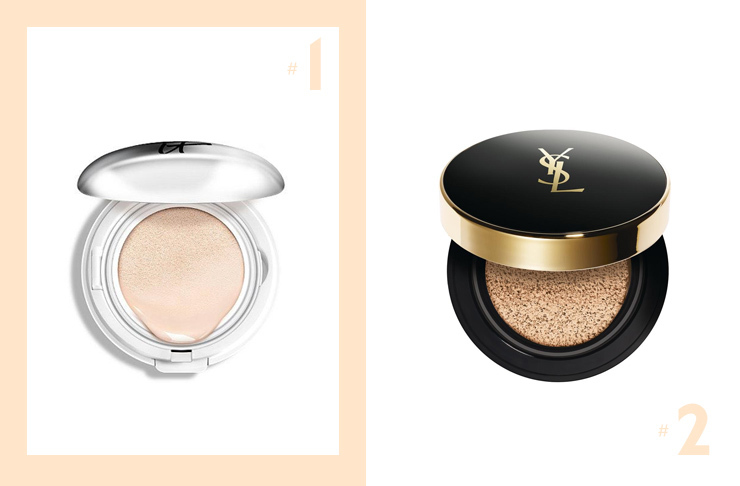 With an air-filled, cushion-stamp design, this innovative foundation ‘ink’ from YSL Beauté offers a flawless, long-wearing, shine-free finish. It comes in six shades and provides medium coverage for an air brushed appearance. Plus, the luxe metallic packaging is total #girlboss goals. Any beauty buff worth her crimping iron would have heard of Lancôme’s ground breaking Miracle Cushion, a pretty little number you’ll love whipping out on the train (the handy mirror makes on-the-go application a breeze). The lightweight, medium coverage formula not only evens the complexion, it gets down to business with some top notch skincare ingredients like pine needle extracts to de-pigment skin, esther oil and glycerin to hydrate and smooth, and adenosine to blitz those wrinkles. It also comes with a slightly mystifying SPF of 23. 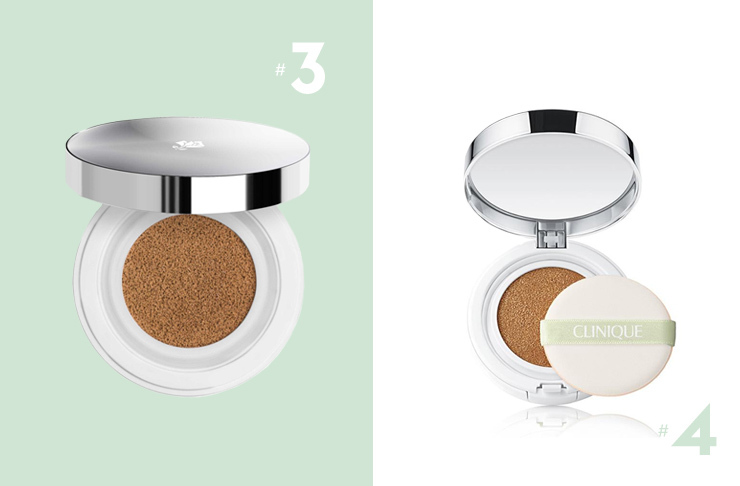 Allergy tested and fragrance free, this innovative BB cushion from our mates at Clinique is another winner. With a natural looking matte finish, it feels gorgeous and cool on the skin and is super hydrating. It also provides broad spectrum protection from those pesky UV rays, and is packed with antioxidants to shield you from the hazards of life in the big smoke. There’s always a show off, and in cushion compact land it’s this one. Instead of using a run-of-the-mill foam cushion, the house of Givenchy has created a metal cushion, designed to protect the fluid from the air, and deliver the perfect amount of product for each application. The foundation itself boasts a high concentration of water and skincare ingredients to correct and plump the skin, and a genius Blur & Glow complex to reflect light. A handful of cosmetics trailblazers are taking the cushion idea further than just foundation, creating squishy applicators for eyes, cheeks, and even lips. 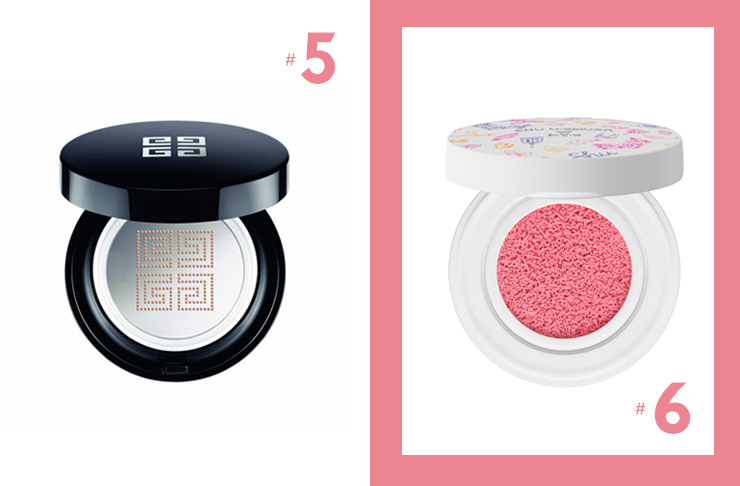 Even if it didn’t contain a gorgeous wash of sheer colour (in either Hibiscus Pink or Orange), we’d be buying Shu Uemura’s Fresh Cushion Blush just for the totally adorbs compact art, created by Korean designer Kathleen Kye. Eye-popping, cheek-popping perfection. We know it’s what on the inside that counts, but seriously, how pretty is this?! Shallowness aside, this cushion foundation from Mecca’s new signature line is great. The sheer, buildable, SPF 30 fluid evens skin tone and leaves the skin looking luminous and glowing. Dab on and blend with the enclosed sponge for skin that appears lit from within. Because variety is the spice of life, we’re going to be sneaky and pop in another cushy goodie that’s not a compact. So sue us. This squeezable tube of champagne-hued illuminator from Sephora has a built-in cushion applicator for all your strobing needs. Gently dab on the desired areas for a little get up and glow. Looking for more beauty inspo? Check out the primers we swear by.